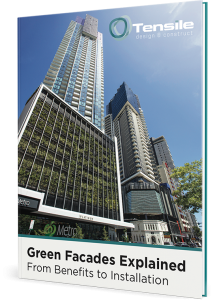 With the benefits of green infrastructure becoming more apparent all the time, the future for green facades in Australia is looking very promising. Certainly the number of green facades in Australia is increasing. At Tensile, we experienced growth in installations of more than 300% in 2016 to 2017 compared to the previous five years. Projects such as One Central Park – one of the tallest facades in the world –showcase how stunning a green facade can be. But it’s not just about aesthetics. Climate scientists all over the world are telling us the globe is heating up. Increasing the number of green infrastructure installations in our cities and towns can contribute to cooling the local environment, help mitigate the impacts of climate change and improve biodiversity. Electricity costs are also on the rise. Any action that can reduce the need for air conditioning in our homes and offices – such as vertical gardens – is therefore likely to be looked upon favourably. Support for green infrastructure in our cities is also increasing. For example, the City of Sydney Council has developed a Green Walls and Roofs Policy encouraging green infrastructure installations. It intends playing an active role in raising awareness and promoting the benefits of green infrastructure. Part of the policy also includes implementing green walls on council-owned buildings and investigating the potential for “demonstration sites”. Once upon a time, phrases like “environmental sustainability” were the words-of-choice for environmentalists. These days, ‘green’ ideas are becoming mainstream, and there is valid, evidence-based research and measurable benefits backing up many green building projects. One example is the Junglefy Breathing Wall in Melbourne. Research by the University of Technology in Sydney demonstrates that the wall is able to absorb pollutants and carbon dioxide incredibly quickly, and to very efficiently cool the surrounding air. But apart from all the science, benefits and government support, just about everyone loves a green space. Incorporating greenery into new or existing buildings can help improve the liveability of our cities. If you would like to know more or you have a green facade project in mind, get in touch with our team.